# If you are also planning to cover Auli with Chopta please let us know and we will arrange that for you. Chopta in Uttarakhand is a place which cannot be described in words, some call it a true paradise on earth and others compare it with Switzerland or kashmir by calling it mini Switzerland in India. Chopta Uttarakhand has been constantly rated among the most beautiful places to visit in winter in Uttarakhand India, but Chopta valley uttarakhand or Deoria tal can be visited in any season to enjoy the beauty of undisturbed nature. We recommend that whenever you do Chopta Chandrashila trek, do not forget camping in Deoriatal. 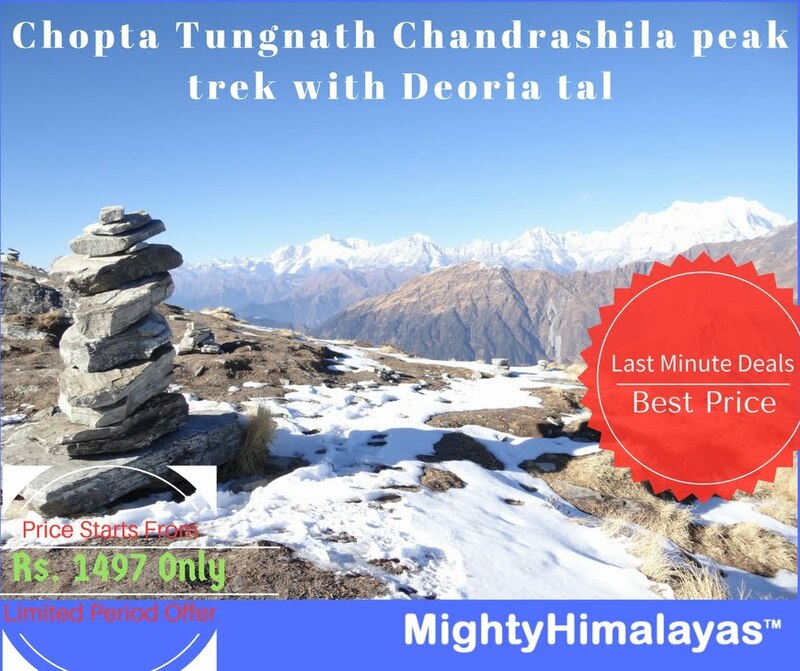 Hence we always prefer to call this trek as Deoriatal Chandrashila trek. We believe that Chopta valley is unique, not only because it has the highest shiv temple (Tungnath temple) but also because of the beautiful landscapes this place has. Chandrashila peak is well known for the beautiful 360 degree view of Mighty Himalayas including Nanda Devi peak. Deoria tal in Sari village is a mesmerising lake situated near Chopta and one can experience the best lake side camping experience there. Instead of staying in Chopta hotels, we would recommend trying camping in Chopta. 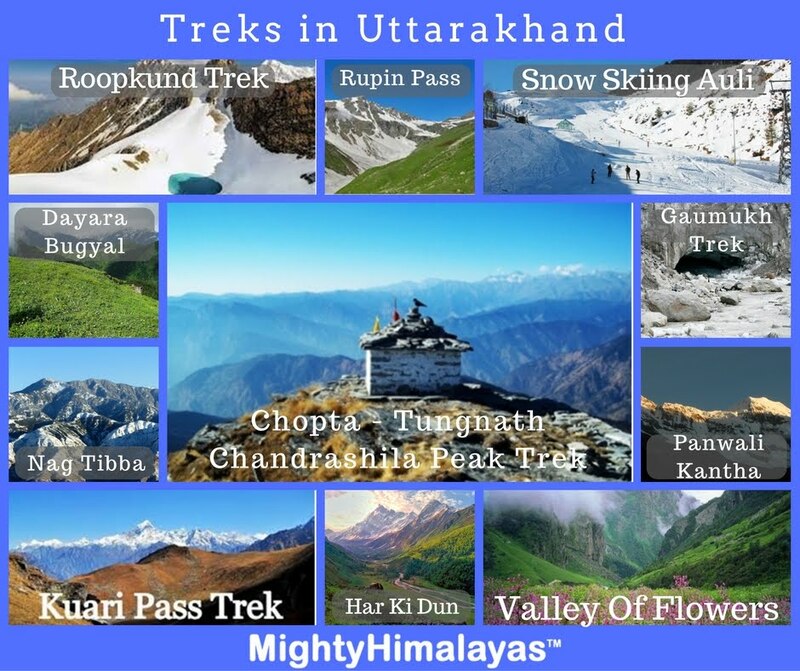 Contact us for the best prices for Chandrashila trek as we only hire local guides and tents/ homestays to support the local community. *Special Group Discounts For 6 or more people. Day 2: Trek down to Saari village. Reach Chopta by road (22 kms.) Trek to Tunganath Chandrashila peak (7 kms). Night stay at camp/ Guesthouse. Day 1: Reach Chopta (Or Saari village for trek to Deoriatal Lake). Night stay at camp / guesthouse after dinner. *Note - This itenary is only recommended for those who do not have enough time, because you would not be able to enjoy the beauty of entire region. Day 2: Trek to Tunganath Chandrashila peak and night stay in camp / guesthouse. Day 2: Trek to Chopta (16 kms.) via Rohini Bugyal.Night stay at camp / guesthouse. Day 3: Trek to Tunganath Chandrashila peak and back to Chopta.Night stay at camp / guesthouse. Day 2: Trek to Deoriatal (3.5 kms) and night stay at camp. Day 3: Guided trek to Chopta (16 kms.) via Rohini Bugyal.Night stay at camp / guesthouse. Day 4: Guided trek to Tunganath Chandrashila peak and back to Chopta.Night stay at camp / guesthouse. Day 1: Reach Mastura Guesthouse / Camp. Reach Saari village by road. Trek to Deoriatal (3.5 kms one side) and back to mustura guest house for night stay. Day 2: Reach Chopta by road (15 kms.) Guided trek to Tunganath Chandrashila peak (6 kms one side). Night stay at Mustura camp/Guest house. Check the Chopta Weather here. How to reach Chopta / Saari village? 1. Reach Chopta By Air: Jolly Grant Airport, Dehradun, is the closest air port from Chopta. You can easily get taxis or buses till Ukhimath. From Ukhimath, shared jeeps are available till Chopta or Sari village. 2. Reach Chopta By Train: Reach Haridwar/Rishikesh by train. Haridwar is approximately 225 km from Chopta and you can easily get taxis or buses till Ukhimath. From Ukhimath, shared jeeps are available till Chopta or Sari village. 3. Reach Chopta By Road (By Bus or car): you can easily get taxis or buses till Ukhimath. From Ukhimath, shared jeeps are available till Chopta or Sari village. *Please note: From Delhi ISBT (kashmiri gate) there is a bus which goes to Guptkashi (near Kedarnath) everyday between 08:00 to 09:00 PM. You can easily get taxis or shared jeeps for Sari village or Chopta from there. Book by Just paying 50% online using below mentioned link and rest 2 days before departure. Limited Period Offer @ Rs.1297 per person - per night (without guide), so Hurry Up! Contact us to get the best price / discounts for the customised or group packages. Within 10 days, no changes in duration, no cancellation & no refund. During your stay if you decide to leave early due to any reason, you will be liable for the full payment of entire duration of booking. What is the best time to visit Chopta? This is an all seasons trek, still the best time to visit is between September & November, when the views of Mighty Himalayas are quite clear. Despite this, if you come for the trek in winter i.e. between Jan & March, the place will be full of snow. When can I do snow trekking in Chopta? /Will there be snow? You can experience snow or snow fall in Chopta from Jan to March. It all depends on weather conditions. Is there any mobile connectivity? Yes, there is some mobile connectivity throughout the trek. Depending on network provider, at some places, there may not be any connectivity. What type of trekking shoes should I bring? We recommend not to carry any normal sports shoes. Because you will need a good traction during the trek, trekking shoes from a reputable brand like Quechua etc. are recommended. What kind of clothing & equipment should I carry? As the weather is cold up there throughout the trek with the possibilities of snow fall or rain, we would suggest that you carry windproof jacket, raincoat, woollen clothes, thermal inner wear, gloves, goggles etc. What kind of food & water will be provided during this trek? Vegetarian meals and safe drinking water will be provided throughout the trek. Can I do this trek solo? Yes, you can do this trek solo, however you will be joining other group of people during the trek. How much luggage should I carry? We would recommend a small backpack which you would be comfortable with while trekking.